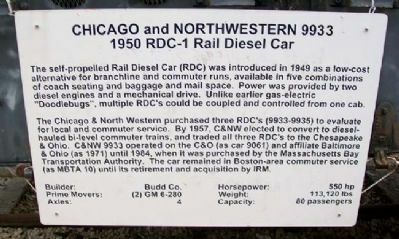 The self-propelled Rail Diesel Car (RDC) was introduced in 1949 as a low-cost alternative for branchline and commuter runs, available in five combinations of coach seating and baggage and mail space. Power was provided by two diesel engines and a mechanical drive. Unlike earlier gas-electric "Doodlebugs", multiple RDC's could be coupled and controlled from one cab. 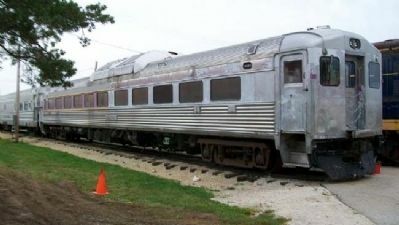 The Chicago & North Western purchased three RDC's (9933-9935) to evaluate for local and commuter service. By 1957, C&NW elected to convert to diesel-hauled bi-level commuter trains, and traded all three RDC's to the Chesapeake & Ohio. C&NW 9933 operated on the C&O (as car 9061) and affiliate Baltimore & Ohio (as 1971) until 1984, when it was purchased by the Massachusetts Bay Transportation Authority. 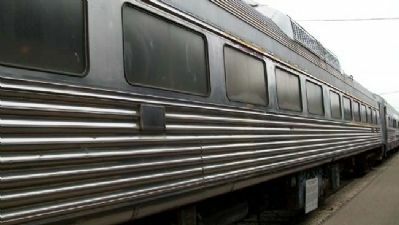 The car remained in Boston-area commuter service (as MBTA 10) until its retirement and acquisition by IRM. Erected by Illinois Railway Museum. 42° 13.68′ N, 88° 31.622′ W. Marker is near Union, Illinois, in McHenry County. Touch for map. Marker is on the unit, in Yard 5, on the grounds of the Illinois Railway Museum. Marker is at or near this postal address: 7000 Olson Road, Union IL 60180, United States of America. Touch for directions. Other nearby markers. At least 8 other markers are within walking distance of this marker. Soo/Milwaukee Road X-5001 (a few steps from this marker); Union Pacific 18 (a few steps from this marker); Railroad Cats (within shouting distance of this marker); Early Railroad Signals (within shouting distance of this marker); Chicago, Milwaukee, St. Paul & Pacific 37A (within shouting distance of this marker); Chicago Railways Company Date Stone (within shouting distance of this marker); Railroad Rails (within shouting distance of this marker); Railroad Standard Time (within shouting distance of this marker). Touch for a list and map of all markers in Union. More. Search the internet for Chicago and North Western 9933. Credits. This page was last revised on June 16, 2016. This page originally submitted on December 23, 2010, by William Fischer, Jr. of Scranton, Pennsylvania. This page has been viewed 624 times since then and 4 times this year. Photos: 1, 2, 3. submitted on December 23, 2010, by William Fischer, Jr. of Scranton, Pennsylvania.